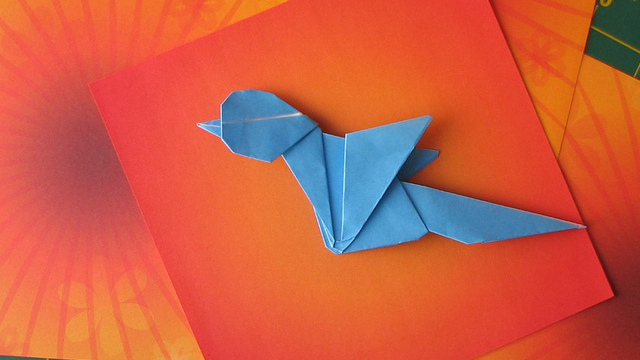 Currently publishers, developers and brands around the globe use Twitter Cards to make tweets more engaging. Now Twitter is making it easier for you to track your performance with the launch of analytics for Twitter Cards. For the first time you can gain insight into how your content is performing on Twitter, which can then be used to influence future decision about your use of Cards. As a bit of a refresher, Twitter Cards make it possible for you to attach media experiences to tweets that link to your content. For example, the Lead Generation Card makes it easy for consumers to express interest in what your brand offers. It allows people to easily and securely share their email address with you without leaving Twitter or having to fill out a cumbersome form. Although a basic analytics tool is already available on Twitter, Twitter Card publishers and advertisers will get access to the new analytics dashboard over the next few days. There you’ll be able to see impressions, URL clicks, and app installs generated by your tweets as well as mentions from others. You’ll also be able to define specific date ranges and create Card comparison charts for more precise insights. You can learn more about analytics for Twitter Cards in this short video demonstration put together by Twitter. Now that you know how the dashboard can be used, let’s take a look at the different Twitter Cards that are available to you. The Summary Card can be used for many kinds of web content, such as blog posts, news articles, products, and restaurants. It’s designed to give the viewer a preview of the content before clicking through to your website. The Card includes a title, description, and a 120×120 pixel image. In addition to the regular Summary Card, Twitter also offers another format that supports a larger image above the title and description of the Card. The default Summary Card features a thumbnail in the upper right hand corner, but if you want to more prominently feature your image, then this is the Card you want. You’ll need to specify an image with a minimum width of 280 pixels and height of 150 pixels in order to use the Summary Card with Large Image. If the image doesn’t meet those requirements then it will not display, even as a thumbnail. This card is similar to the Summary Card with Large Image in that it emphasizes your visual content. However, unlike the previous cards, the Photo Card is less concerned with the description. It’s also worth noting that this is the only type of card that can support a blank title. To use the Photo Card, set your card type to “photo” and provide the image. Twitter will resize it, maintaining original aspect ratio, to fit the following sizes: a maximum height of 375 pixels and width of 435 pixels on web, 375 and 280 pixels respectively on mobile (non-retina displays), and 750 and 560 pixels respectively on mobile (retina displays). If the minimum size of the photo isn’t 280×150 pixels, then Twitter won’t create a Photo Card. We should also note that animated gifs aren’t currently supported. This is a great option for anyone looking to drive awareness or attention to a single photo. If you’re looking to share a collection of photos within a tweet, then you’ll want to check out the Gallery Card. It’s designed to let a viewer know that there’s more than just one image at the URL shared. You’re able to specify up to four different images to show in the Gallery Card preview. 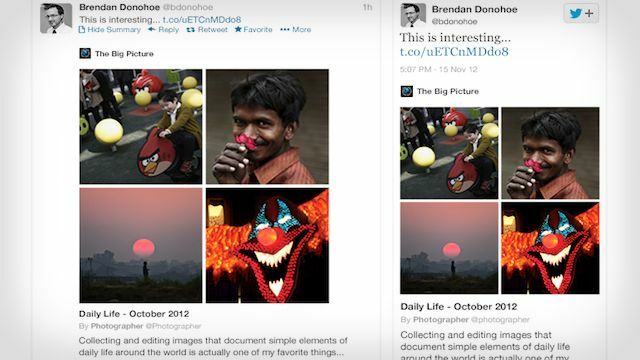 You can also provide attribution to the photographer through the twitter:creator tag. Each image must be less than 1MB in size. Additionally, if you intend to add a description to go along with the gallery you have 200 characters in which to do so. 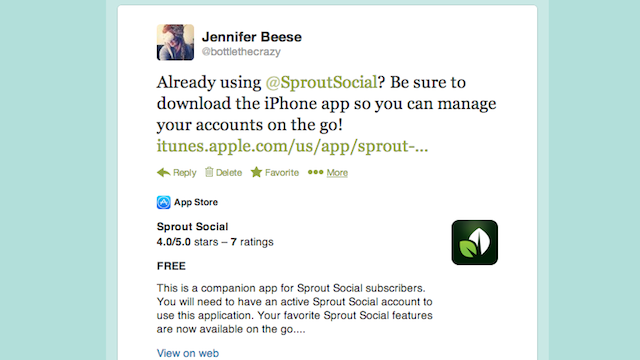 The App Card is a great way for developers to promote mobile apps and drive installs on Twitter. The card allows for a name, description and icon, as well as highlighted attributes like the rating and price. The latter, however, will require adding some additional markup tags to your pages. 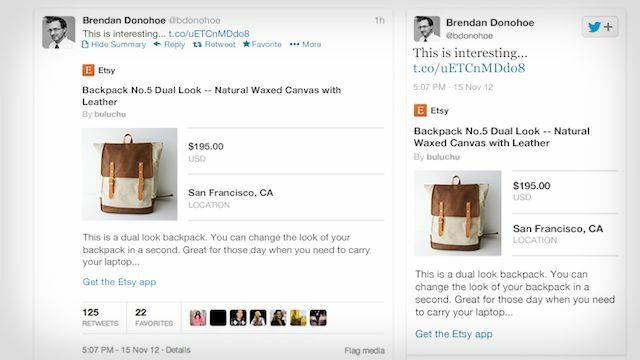 Twitter auto-creates App Cards for tweets that contain links to either the App Store or Google Play. This means that you can create an App Card just by sharing links directly to the download page for your app. Currently it only supports iOS and Android mobile clients — it’s not yet available for desktop or the mobile web. The image for the App Card is downloaded directly from the platform on which your app resides. To ensure that this works properly, the image uploaded to iTunes or Google Play must be less than 1MB in size. The Player Card supports streaming media experiences, such as audio, video, or slideshows. It’s a great way for you to present your content inside of a tweet. But unlike the Photo and Summary Cards, you control the entire experience and are responsible for providing a version that works across Twitter.com (and mobile.twitter.com), Twitter for iPhone, and Twitter for Android. Player Cards work differently on each client. Because of this, it requires special approval and isn’t available for immediate approval at this time. We recommend that you read through the documentation — which includes help Do’s and Don’ts — available for the card before you begin building your card experience. Last but not least is the Product Card, which enables you to feature retail items on Twitter and drive sales. This card is designed to showcase your products with an image, description, and two additional details about your product — price, availability, sizes, and so on. The Product Card requires an image size of 160×160 pixels or greater. Square images are preferred, but Twitter will crop and resize oddly shaped images to fit as long as both dimensions are greater than or equal to 160 pixels. One of the most important features of Twitter Cards is the ability to download your app (if the viewer doesn’t already have it installed) or deep-link into your own app (if the app is already installed on the viewer’s device). This functionality is available across all Twitter Card types. All you’ll need to do is add a new set of markup tags, which is explained in Twitter’s documentation. Twitter has also provided you with a validation tool that lets you see a preview of your card and ensure that all parts are working correctly. This can be accessed directly from any Twitter Card page or by visiting dev.twitter.com/docs/cards/validation/validator. Once your card is complete and out in the wild, be sure to monitor its performance through the new analytics dashboard.